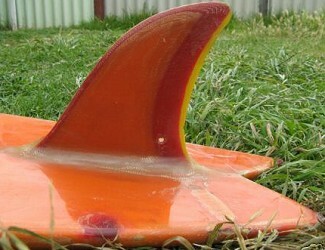 MANUFACTURER: Blaxell Surfboards,Scarborough Beach Road, Osborne Park, Western Australia. Foam blank, resin glueline stringer?, tinted Volan laminate? Vee Volan deck and tail patches, red resin pin lines, left-hand post-production legrope plug. Bottom: Aboriginal and sun graphic and text - Black, gold and red. Bottom: C. Young 1255 7'2'' x 18'' - pencil at tail patch apex. Deck: Clear with light green rail and red resin pin-line. Vee Volan deck patch and left-hand post-production legrope plug. Bottom: Light green tint laminate with Vee tail/fin patch. Images and information submitted by Gary McCormick, November 2007, with thanks. 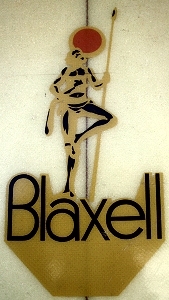 "Tom Blaxel started manufacturing surfboards in the early 1970's in Scarborough Beach Road, Osborne Park. Prior to 1973 Tom was doing most of the shaping and glassing himself. He employed Chris Young (Nat's younger brother) in mid 1973 to shape many boards including one for myself for a surfing tour from WA to Qld in January 1974. I have entered a decal shot including photos of Chris's signature and the board. Board size was 7'4" x 18" with a single fin , complete with leg rope hole. Surfing WA Inc / Mullaloo Longboard Club Perth"
From Brad Cecins: Western Australian Surfers of the Year Awards 2006. Tom Blaxell was always destined for a life in the surfing industry having grown up across the road from Scarborough Beach and spending most holidays as a 'grom' on Rottnest Island. He made his first board in 1964 and over the next four years developed his skills to a point where he opened Blaxell Surfboards on Scarborough Beach Road. Some of the state's hottest surfers sought his equipment with Bob Monkman, George Simpson, Tony Hardy, Paul Cunningham, Russell Catto and Ken McKenzie enjoying the fruits of his labour. As the surfboard industry blossomed, Blaxell Surfboards fast became a place for 'top shelf' shapers to hone their skills. Greg Laurenson, Tony Hardy, Tom Hoye, Mike McAuliffe, Al Bean, Alex Korwin, and Benton Moran all spent time in the Blaxell shaping bay. Tom's love of the ocean saw his business change direction with the inclusion of boat design and manufacturing under the Blaxell Sufrider name until the mid 1980s. Blaxell Surfrider was a major sponsor of competition surfing including the prestigious King of the Point event and the State Scholastic titles for a number of years. Tom was instrumental in the formation of the Dolphin Surfriders where he became a club champion as well as President and a Life member. With the demise of the Dolphins, Tom repeated his contributions with the Trigg Point Boardriders (Club champion, Patron and Life Member). His administrative skills were also put to good use with Surfing WA in a variety of roles; Vice President in the late 60s, Head Judge for the 1973 Australian Titles, Secretary in the late 70s, Life Member in the 80s, Secretary in the mid 90s and President in the late 90s. Tom also served on the Coastal Advisory Committee to the City of Stirling and the State Government's Artificial Reef Committee. He counts the establishment of the artificial reef at Cable Station and the Surfing WA headquarters at Trigg Beach, as two of his biggest contributions to Western Australian surfing.